Both stuttering and stammering refer to the same speech disorder which is characterized by the disrupted flow of speech. Basically, the main difference merely lies on the location where these words are usually used. “Stutter” is more commonly spoken in Australia and North America while “stammer” is more popular among British speakers. Stammering/Stuttering increases when the individual feels excited, tired, anxious, and other related intense emotions. This condition is more frequently manifested among men than women with a ratio of 4:1. This disorder relatively begins at two to five years old which is a window period for language development. The symptoms often significantly decrease when singing, whispering, and talking to pets. There is an observed elevated dopamine level among those who stutter/stammer. Stutter came from the German word “stutzen” which means “to cut short”, or “hesitate”. Noticeably, stuttering is a fluency disorder. Particularly, it is defined as “a particular speech disorder in which the flow of speech is involuntarily blocked or disrupted. The block begins in the brain and is often sensed by the speaker before he attempts to say the word” (Parry, 2013, p. 3). Stuttering Foundation of America (SFA): This was founded by Malcolm Fraser in 1947 and they operate by the motto: “A non-profit organization helping those who stutter”. Their headquarters are in Memphis and Tennessee. National Stuttering Association (NSA): This is a non-profit organization which was founded in 1977 and it is based in New York. European League of Stuttering Associations (ELSA): ELSA was found in 1990 by 12 countries and one of its particular goals is to lobby at an international level. International Stuttering Association (ISA). ISA is also a non-profit organization which was founded in Sweden in 1995. Their motto is “A world that understands stuttering” and the current chair is Annie Bradberry. American Institute for Stuttering (AIS): AIS was founded by Catherine Otto Montgomery in 1998. It is a non-profit organization which has offices in New York and Atlanta. Stammer came from the Old English word “stamerian” which also means “stumble”. Similarly, the tongue seems to stumble when people stammer. As what was mentioned, stuttering and stammering are simply two different words which mean the same exact thing. “The word stammering is more widely used in the UK, while the term stuttering is more common in America” (Whyte & Kelman, 2012, p.17). The authors further that a person who stammers may contort his body or face to be able to speak more fluently, stretch out a certain sound, get stuck on a phrase, or repeat a syllable. A known organization which uses the term “stammering” is the British Stammering Association (BSA). It is a charity organization and is affiliated with ELSA. BSA was found in 1978 and the current chief executive is Jane Powell. They are based in London, UK. The term “stuttering” is more closely associated with APA particularly in the Diagnostic and Statistical Manual of Mental Disorders or DSM 5. Under Communication Disorders, “Childhood-Onset Fluency Disorder (Stuttering)” is indicated. This makes sense since stuttering is a more predominant term than stammering in the USA. Stuttering came from the German word “stutzen” which translates to “hesitate” or “to cut short” while stammering came from the Old English word “stamerian” which means stumble. There are more national and international organizations which use the term “stuttering” as compared to “stammering”. For instance, search results for “stammering” generally shows the British Stuttering Association while those for “stuttering” are Stuttering Foundation of America, International Stuttering Association, and European League of Stuttering Associations among others. According to the Ngram Viewer which shows a graph of the frequency of how a phrase or word has occurred in a corpus of Google books, the peak for “stammering” was in 1920 at 0.0001096% while that of “stuttering” was in 1952 at 0.0001725%. The most recent Ngram is in 2008 and the result for “stammering” is 0.0000406 while that for “stuttering” is 0.00001056. The figures reflect that as compared to “stuttering”, “stammering” occurs more frequently in written texts. Some of the common symptoms for stuttering or stammering are repetition, delay, extension, and prolonged pauses in producing speech. Though there is no known specific cause, it is more common among males and is exacerbated by intense emotional states. “Stutter” is more commonly spoken in Australia and North America while “stammer” is more popular among British speakers. The term “stuttering” is more closely associated with APA particularly in the DSM 5. There are more national and international organizations which use the term “stuttering” as compared to “stammering”. The figures from Ngram Veiwer reflect that as compared to “stuttering”, “stammering” occurs more frequently in written texts. gene balinggan. 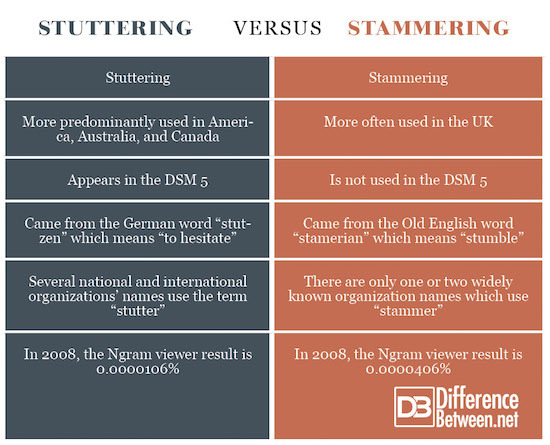 "Difference Between Stuttering and Stammering." DifferenceBetween.net. July 23, 2018 < http://www.differencebetween.net/science/difference-between-stuttering-and-stammering/ >. Guitar, Barry. Stuttering: An integrated approach to its nature and treatment. New York: Lippincott Williams & Wilkins, 2014. Print. Kelman, Elaine. & Whyte, Allison. Understanding stammering or stuttering. London: Jessica Kingsley Publishers, 2012. Print. Parry, William. Understanding and controlling stuttering. Pasadenia: William D. Parry, 2012. Print.